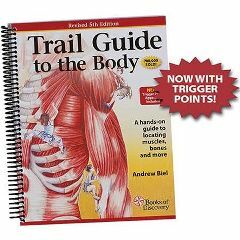 Trail Guide To The Body Textbook, 5th Ed. Books Of Discovery Trail Guide To The Body Textbook, 5th Ed. Before you can assess or treat a muscle, you first must be able to locate it. This acclaimed book delivers beautifully illustrated information for learning palpation and the musculoskeletal system. It makes mastering the essential manual therapy skills interesting, memorable and easy. With 440 pages and 1,400 illustrations covering more than 162 muscles, 206 bones, 33 ligaments and 110 bony landmarks, this text provides an invaluable map of the body.